Fantastic auto detailing training seminar that was broken down into two very effective and beneficial parts. First day covered the marketing and business aspect of it. This will help many including myself- to develop my hobby into an actual business. 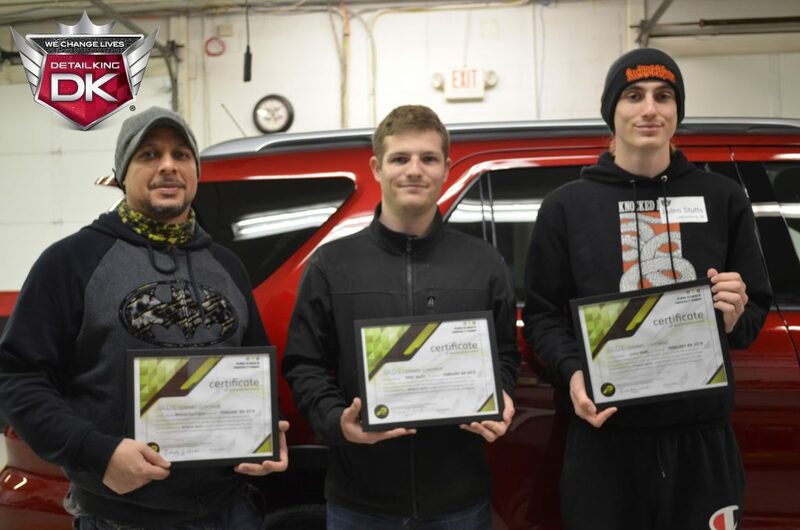 The second day was very hands-on and was led by friendly knowledgeable trainers who took the time to answer all questions and actually taught rather than “putting on a demonstration.” I attended the March 2015 Technician Certification Program. I found the seminar to be well planned and offered many avenues for ” follow up ” questions or issues that I may have. 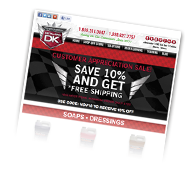 You come away with the impression that the people at Detail King really care about your success and want to partner with you as much as they can. The staff are friendly, accessible, and very genuine . 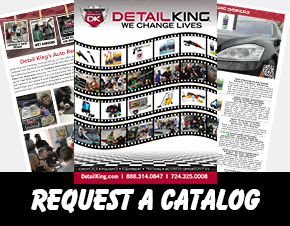 I am just getting my detail business started but could not have imagined a better place to start and a better company to guide me through the process and partner with me in the future than Detail King. Thanks again and I highly suggest this auto detailing seminar! 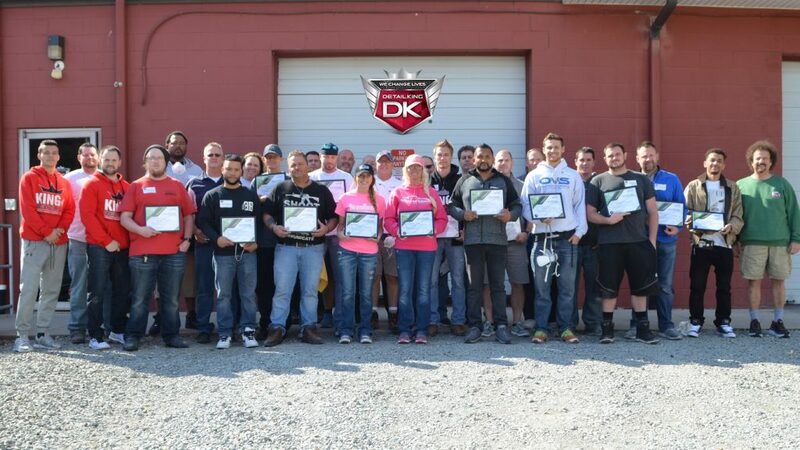 Detail King LP’s Ceramic Coating Training & Certification will be a one day Seminar Class held at our headquarters in Pittsburgh PA, on May 31st 2019. Class will be limited to only 20 students. We will cover the critical components of Ceramic Coating. We will discuss the science behind these coatings in our Classroom for the first part of the day and how to offer Ceramic Coatings to your customers. The rest of the class will be Hands-On Paint Correction and Ceramic Coating Training. This is where our Students will learn how to fine-tune their Paint Correction skills to ensure complete correction prior to applying the Ceramic Coatings. At the end of the class you will receive a Jade Certification Certificate of Completion. You will be Jade Certified. This certification will open new doors for you to be able to offer very profitable Ceramic Coating services to you customer base. This class is being presented by Detail King LP and is not part of the Detail King Auto Detailing Training Institute Curriculum. Be sure to check out our Frequently Asked Questions about our Jade Products! Now all Detail King Certified Jade Installers can submit their customer’s vehicle information to Carfax. This is a great benefit to aid the vehicle owner when it comes time to market the vehicle to be sold. All of the Jade coatings that were applied can be documented on the Carfax report, this could increase the resale value of the vehicle. Download the Jade Carfax Form here. As an added bonus, Detail King will be hosting Rupes Area Sales Manager Travis Barnaby at our headquarters in Plum, Pennsylvania for a day of Intermediate Polishing Training with Rupes Bigfoot Polishers and products. You will learn the differences between the types of polishers on the market today, and you’ll get HANDS ON experience with each of them to find which fits you best! Join us at this one day session focusing on taking your paint correction skills to the next level! This event will contain a morning classroom style portion explaining tool movements and their interaction with the surface of the paint along with when and why to choose a certain system over another. The afternoon will consist of hands-on training allowing all attendees to work with RUPES full line of polishing tools INCLUDING the new Mark III random orbital tools! Registration will be limited to 20 students. This paint correction training will go hand-in-hand with our Jade Ceramic Coating Certification. For a perfect Ceramic Coating application, paint correction is paramount! 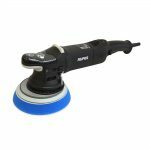 Rupes Polishers are the perfect tool to assist with paint preparation for Jade Ceramic Coatings. 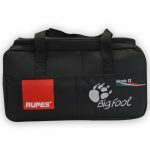 All 20 students will receive a Free Rupes MK II Polisher Bag & Special Pricing on MK II Bigfoot Polishers! 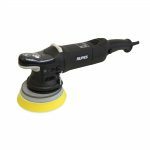 Rupes Products, Polishers, and Pads will be used for Paint Correction. Class video of our fifth Jade Ceramic Coating Certification Students, held April 5th 2019. Students will be trained on the use of Detail King’s Jade Ceramic Coating Products by Puris®. We will cover wash-up and prep using Detox Wash & Seal, which is designed to be used on a vehicle that is going to be (or already has been) coated with Jade Ice or Jade Quartz. The students will then be introduced to our Caliber Silica Primer Polish to remove any imperfections in the paint. After the vehicles have been paint corrected and all imperfections removed, the students will then clean and prep the vehicle’s surfaces with Refresh Surface Prep to ensure all oils and dust have been removed from the vehicle. After all of the prep work has been completed, the students will apply our Jade Ice and Quartz Ceramic Coatings to the demonstration vehicles. We will also demonstrate the proper use of our Reboot Silica Spray, which is to be used as a Quick Detail Spray to both clean and heal your coating. 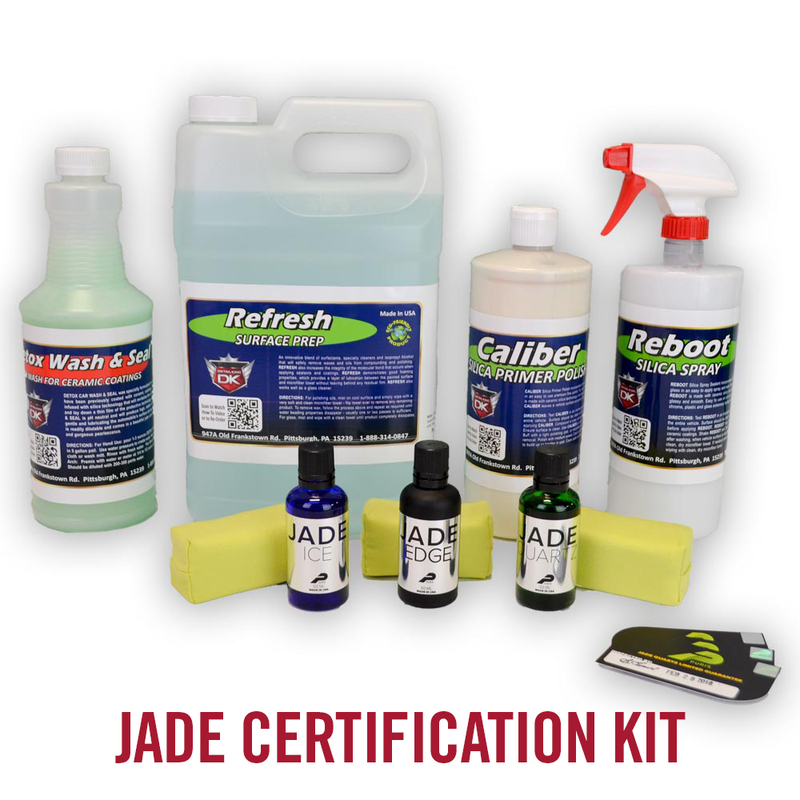 Besides the classroom and hands on Ceramic Coating Training and Certification you will also receive our Jade Certification Kit. This kit includes: Jade Edge Plastic Trim Coating w/Applicator (1), Jade Ice Ceramic Coating w/Applicator (1), Jade Quartz Premium Ceramic Coating w/Applicator and 3 Warranty Cards (1), Jade Detox Wash & Seal (1 Quart), Refresh Surface Prep (1 Gallon), Caliber Silica Primer Polish (1 Quart), and Reboot Silica Spray (1 Quart). All of these items included is enough Jade product to prep, coat and maintain at least 6 to 8 vehicles, which could generate you between $3,000 and $4,000+ of profitable sales. Both the Jade Ice and the Jade Quartz products that are included with this kit are the Professional Installer series. We will also demonstrate the newest Jade products that are now available at Detail King. 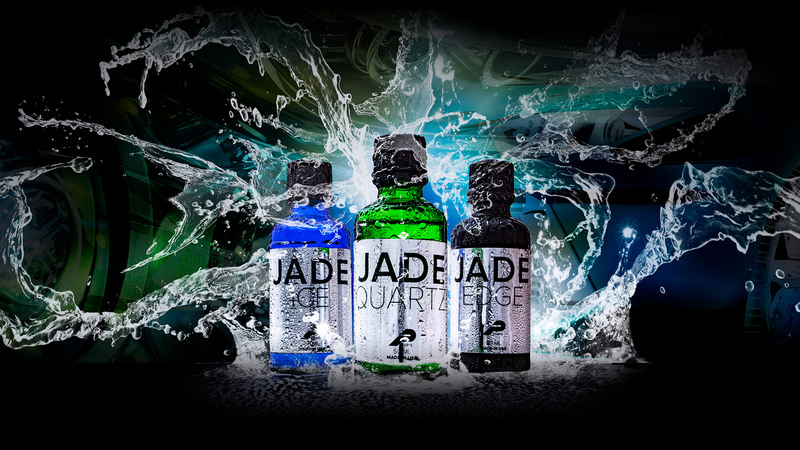 These new Jade products are; Jade Hydrophobic Ceramic Spray, Jade Waterfall Touchless Silica Spray, Jade Complete Acrylic Tire Coating, and Jade Water Glyde Glass Sealant. and Jade Water Glyde Glass Sealant. We will offer these products at a discounted cost for anyone that attends the Jade Ceramic Coating Class. The cost of the Training Certification that includes the Jade Certification Kit is only $795 per person. If you want to register for the certification class and not have the kit included the cost is $399. You will be able to purchase the kit at the class for $491.95. The class will be limited only to the first 10 registrants. A continental breakfast and a hot lunch will be served the day of the training. You can register for this class by contacting us at 724-325-0008. This class is presented by Detail King LP and is not part of Detail King Auto Detailing Training Institute’s seminar programs. Payment must be paid in full upon registering for the class. We can provide you with lodging information for local motels and hotels located close to Detail King which we have arranged a discounted rate. To reserve your room at the Hampton Inn, Monroeville, PA which is only minutes from the Detail King facility you can contact them at 412-380-4000 or reserve your room online. Our corporate room reservation booking code is 0003141664. To reserve a room at the Hampton you must book 3 weeks prior because there are always many other events going on in the Monroeville/Plum area May 31st 2019. You may also want to contact the Super 8 – 724-733-8008 which is just one mile from Detail King or the Holiday Inn – 412-372-1022 which is located next door to the Hampton. The Hampton is where we have special rates set up for Detail King customers. JADE Ceramic Coatings will provide unrivaled gloss and up to 4 years of durability and protection from UV rays and corrosion. Once treated with a Ceramic Coating, a vehicle will repel water and contaminants while maintaining a clear, hard-as-nails finish. Ceramic Coated Vehicles stay cleaner longer, require less frequent polishing, and require no additional paint protection unless desired. Detail King has become certified to install and train others to install our line of Jade Ceramic Coatings, which are all self-cleaning, anti-static, weather-resistant ceramic Nano-coatings that provide unrivaled protection. JADE works on the molecular level to transform the surface into a smooth as glass finish that almost nothing will stick to! Ceramic Coatings have taken the Auto Detailing Industry by storm. These Nano-Crystalline Coatings form a Hydrophobic barrier to protect your vehicle from the harsh elements. Our Jade line of Ceramic Coatings offers up to 4 years of protection! A vehicle that has been treated with a ceramic coating will bead up and repel water much more than a traditional Carnauba Wax or Polymer Sealant (see below). 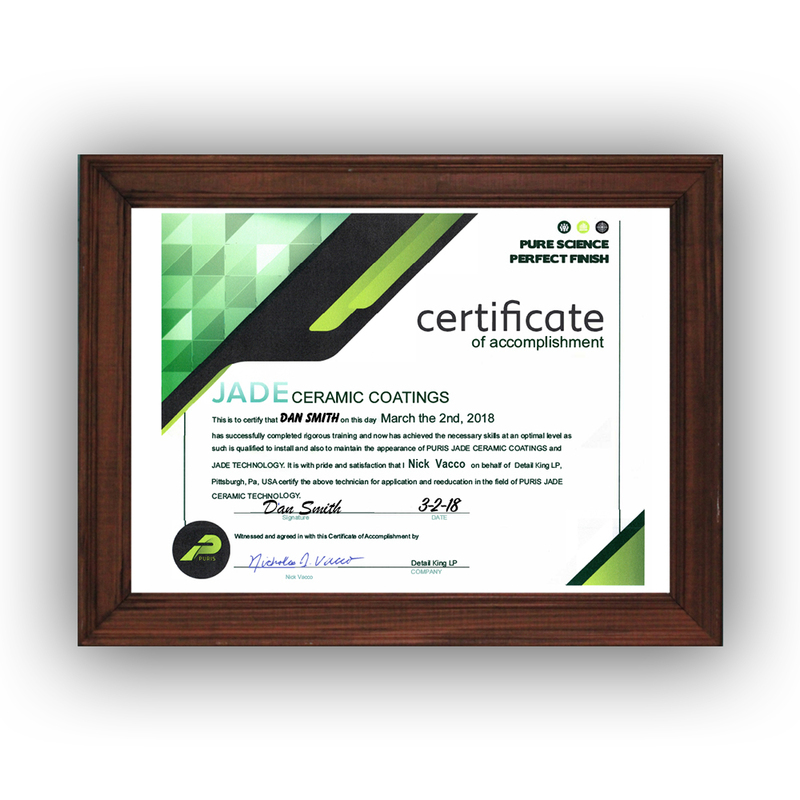 Here at Detail King, we want to offer the best form of Ceramic Coating Training and Certification possible, which is why we have had the entire Detail King team certified in JADE Ceramic Coatings. If you are looking to offer Ceramic Coating to your customers, it’s imperative that you learn the proper procedures necessary to apply them correctly. Now is the time to enroll in one of Detail King’s Ceramic Coating Training & Certification Classes! We have limited space available, so be sure to register early to guarantee your spot! Don’t wait to register! 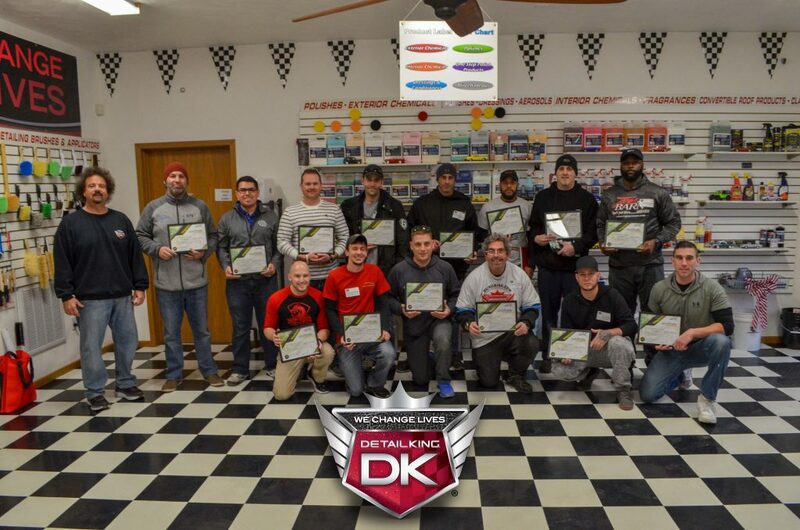 Sign up NOW to guarantee a seat at our Ceramic Coating Training & Certification Seminar at Detail King May 31st 2019 in Pittsburgh PA. The class will fill up fast so don’t stall and think about coming, pick up the phone and call us now and be one of the first professional detailing companies in your town to provide profitable Jade Ceramic Coatings! Graduation Pictures from our Jade Ceramic Coating Certification Classes! – Click one to watch the video from that class!